Fake gold bars are in the news at the moment due to a discovery recently of a gold bar in the UK filled with tungsten so detecting fake gold bars is important to ensuring that you retain the value of your gold bars. When you buy gold bars you expect them to be real gold bars, not fake. 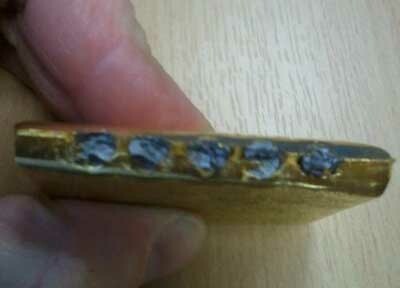 Fake gold bars are those which have had the gold drilled out of them and the gold replaced by tungsten. Tungsten is a similar weight to gold and so the difference is not easily detected at once. But if you weight the bar there can be enough of a difference to warrant further inspection. A 1kg gold bar can be drilled and drained of most of its actual gold content and then replaced with tungsten. Such a bar is going to be two grams lighter than a normal gold bar. Many of these 'gold' bars can be in existence undetected as it is rare that anyone actually tests every individual gold bar they have. In fact Sen. Ron Paul has questioned on more than one occasion if the gold bars in Fort Knox are 100 percent pure. Currently there has been no answer to this question. If, as some analysts speculate, there are hundreds of these bars in circulation then the true supply of gold in the market place is going to be substantially less than the experts agree. This can affect the gold price as it increases the rarity of gold available. It at least increases the costs involved in obtaining and checking gold for purity and that can only add to the over price of gold also. So when you buy gold, make sure you BUY GOLD and not some tungsten fill gold bars. You can check for tungsten and other minerals or metals in gold bars by melting them down and separating the various metals. Each metal melts at a different temperature, for example tungsten melts at a higher temperature than gold, so the different metals become apparent then. Of course this is an expensive and laborious job and really only should be attempted if one can afford the time and expense and has a number of bars which one feels may be faked. Another way to detect fake gold bars is the weight them. In a 1kg gold bar the difference will be about 2 grams. Not a great deal but enough to warrant further investigation. Larger bars will have a larger difference in weight of course and smaller bars, a lesser difference in weight. You might consider that it is hardly worth while for the smaller bars due to the amount of work involved drilling and replacing etc. But keep in mind that smaller bars carry a very tiny fraction of weight difference and so extremely hard to detect and with today’s gold prices it becomes a viable proposition. But even this is not guaranteed as if someone takes the time and trouble to mix say iridium with the tungsten to match the weight of the missing gold, in itself a laborious process, then weighing the gold bar or bars may be insufficient as a detecting measure. According to Hans Zoebelein, of Goldstube24.de, a precious metals trading company in Germany, a very effective way, for smaller bars, is to use eddy current meters. "Fine gold and fine silver have pretty characteristic conductivities. Add some tiny amount of some other metal to gold or silver and your conductivity changes heavily. Same goes if you having a thin layer of gold or silver above another metal. A minor problem is the limited depth of measurement. You usually are getting a measurement depth of around 0.3mm, but if you are checking small gold bars up to 100 gram eddy current alone is good enough to validate that your bar is OK. The problem is the big bars. They could be filled with tungsten and that fake material would be sitting deep enough. It won't be detected by your eddy current meter if there is enough gold between the surface and the filling. The eddy current tester would tell you that the top most layer is fine gold. But it wouldn't find out about the stuffing. Here the ultrasonic instrument is coming to your rescue. It shows you whether the big thick bar is homogenous. Or if it is a "gefillte fish" with tungsten buried below some millimeters of fine gold. Testing small bars, even if they are sealed in plastic foil (less than 0.5 mm thick) takes only a few seconds. Testing many kilograms of silver medals for fine silver takes you a few minutes only. Add 0.5% of another metal to fine silver and conductivity breaks down. Also distinguishing genuine coins from fake coins (even if metal composition is the same!) is much easing with an eddy current tester." When you are buying gold bars then the first thing to do is make sure you buy from a reputable dealer. Do your due diligence on the gold dealer and ensure they are bona fide and have been trading for some time. Check they have a fix premises and not just a website and hotmail email. Then ensure they carry a guarantee of authenticity for the gold bars INCLUDING a return of the bars if they are found to be fake gold bars. All bars should have a serial number on them which is listed on the invoice so they can be tracked and the dealer knows you are not buying a genuine bar and returning a fake. If you are buying a large quantity it is possible to have the bars checked with ultrasound. The same device as used to check the condition of unborn babies in hospitals. This will detect any abnormalities such as you would find with a tungsten filled bar. The difference in density between gold and tungsten will show up with the ultrasound. Apart from making sure one does not lose the value of one's gold, detecting fake gold bars is important as it helps to maintain the accuracy of the gold price when you buy gold.